The Southwest Florida Military Museum and Library now has a top secret way to send and receive messages should it ever need to. 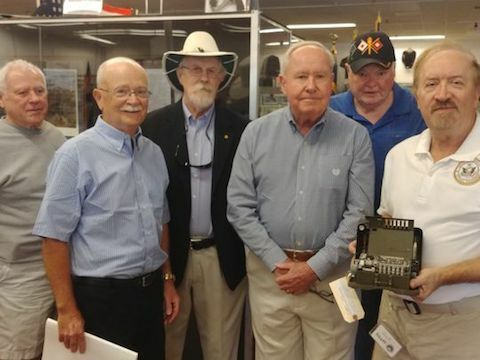 The Phoenix Society, made up of retirees from the National Security Agency, secured an M-209 Cipher Machine — one of about 140,000 ever made and used to send encrypted information during World War II and the Korean War. Museum Director Sonia Raymond said the donation this week fills in a small gap in the vast military history the 34,000-square-foot Cape Coral museum holds. "There is lots of history here," she said, with artifacts and memorabilia from the American Revolution to current day. The largest exhibit focuses on World War II. Jim Elliott, a U.S. Army Spec. 4, worked as a top secret cryptographer with the tactical device. He studied it during the donation, pleased to have an artifact that represented his time in the military. Developed in 1940 by Borish Hagelin in Sweden for the U.S. Army, the M-209 could encipher a plain text message of any length, automatically printing it on a half-inch wide paper tape in 5-letter groups, or decipher a message cryptographed by another converter. Soldiers in World War II and the Korean War used this machine to send and interpret coded messages. By 1943, U.S. intelligence assumed that German code breakers could break the code in four hours. "But by the time they broke them, the event was completed," said Joe Browne, of Venice and a Phoenix Society member. Because of its success and portability, the military used it in Korea as well. A small olive box, the size of a compact disc carrying case, holds the unit. This one is courtesy of The National Cryptologic Museum near NSA headquarters at Fort George G. Meade, Maryland. 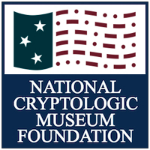 The museum acts as a repository for cryptography machines, Browne said. The M-209 joins the STU III, the secure phone similar to the one George W. Bush used during the Sept. 11 attacks on the U.S. 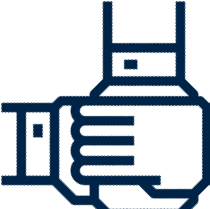 The STU III was developed in 1987 and highlights secure technology as a way to transfer critical information. "This is a great place with so many different artifacts," Browne said, saying it had nearly "nothing from the NSA." At the Museum & Library, the M-209 Cipher Machine joins the secure STU III phone - a phone model developed in 1987. The phone is like the one George W. Bush used immediately after the Sept. 11 attacks to remain in contact with Washington, D.C., from Florida. The Cape Coral museum has hundreds of thousands of military artifacts and memorabilia, as well as a military library with more than 5,000 books. "It is one of our first donations from a well-known museum," Raymond said. "We're really pleased to be the recipient." What: The Southwest Florida Military Museum & Library, with exhibits, artifacts and memorabilia from the American Revolution to the present.